Last summer, an enormous rock avalanche destroyed an entire village in a remote mountainous area in the eastern margin of the Tibetan Plateau (Sichuan, China), leaving almost 100 people dead or missing. In a paper published this week on Landslides, we showed that the landslide produced a distinctive seismic shaking, a landquake, clearly identified by the broadband seismic stations nearby. 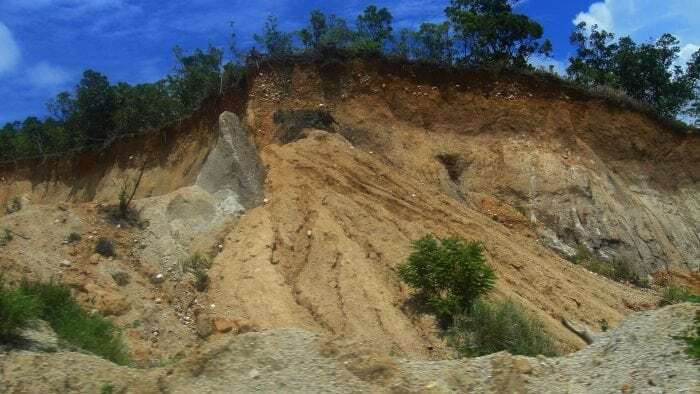 Seismic monitoring can be upgraded to help scientists and policymakers setting up automated landslide alarm systems, which could be able to trigger an effective emergency response in the blink of an eye, saving more lives. Xinmo was a peaceful settlement on the left bank of a small creek, surrounded by beautiful forests and stunning mountain crests. But then, at 5 in the morning of Saturday 24th June, after days of rainfall, a piece of the mountain on the back of the village suddenly broke down. We spent sleepless nights investigating the mechanism of this deadly rock avalanche: how it started, how it rushed along the slope, how it hit the houses and finally came to a rest on the valley, blocking the course of the creek for more than one kilometer. It became clear immediately that the sliding mass must have acquired a tremendous speed because when it splashed into the river it threw water and mud hundred meters high on the opposite slope. However, no witnesses could confirm this hypothesis, and no footage was recorded. Survivors only referred to have heard loud rumbles just seconds before the fury of the avalanche hit their houses. A family, kept awake by their few months old baby, could save themselves by miracle, while many others were caught in their sleep. Due to the remoteness of the area, calling for help and sending a rescue force must not have been an easy thing. This reminds me of a shameful situation which happened in Italy last winter when a ski resort was buried under a snow avalanche, and the difficult communication between witnesses and authorities delayed the emergency response by hours (as the event was initially largely underestimated), probably increasing the number of victims. In Xinmo, professional rescuers reached the site quite promptly, but they could have been quicker if they had received more detailed information about what exactly had happened. In such situations, every second can make a difference between death and survival. A few days after the avalanche, we were already analyzing all the available data to give answers about the landslide mechanism and evaluate the residual hazard in the area, as the rescue operations were still ongoing, more rain was falling copiously and the mountain showed large cracks which worried us of possible new landslides which could happen any moment. We received great help and collaboration from research groups of several universities, public and private laboratories. The results of the investigations of those days have been published on Landslides, the leading journal on this topic. In particular, we could analyze the recordings of several seismic stations in the area. In a radius of hundreds of kilometers, a distinctive seismic activity was recorded, significantly different from that of a tectonic earthquake. Similar to this latter, the epicenter could be identified automatically and the Richter magnitude (ML = 2.3) could be calculated. 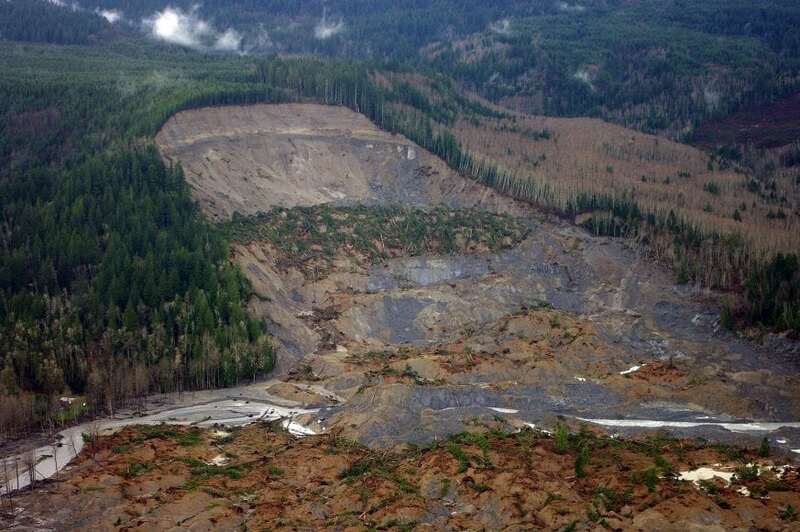 Here we go: a monitoring system detected the landslide, its location, and size. But the system was not trained to understand, automatically, that a large landslide had occurred, rather than a weak earthquake, thus the signal went unnoticed. In Taiwan, a group of scientists led by Dr. Chao has already developed an algorithm to discriminate between earthquake-generated waves and landslide-generated waves (landquakes). They incorporated it and tested it in a system which can trigger an alarm in near real-time with very promising results. They explained their findings on an exciting paper on Scientific Reports earlier this year. But there is more. By analyzing the seismic waveforms, one can see that a landquake has a distinctive signature. Dr. Yamada and his colleagues of the Disaster Prevention Research Institute (Kyoto, Japan), explained this in detail in a recent work published in Geophysical Research Letters. There is a low-frequency component, which has been linked to the elastic response of the earth crust induced by the acceleration and deceleration of the landslide mass (Dr. Ekström and Dr. Stark on Science), and a high-frequency component, distributed in time, produced by the complex momentum exchanges between the debris and the bedrock while it is sliding and impacting in the deposition area (Dr. Lin and his colleagues on Earth and Planetary Science Letters). The initial release of the low-frequency waves has been related to the landslide initiation, when the mass detaches from the bedrock producing an elastic rebound, while the peak of the high-frequency waves has been related to the moment of largest energy dissipation, which occurs when the sliding mass impacts the valley, where the slope angle is much smaller and slows down significantly. We identified the two frequency components by analyzing the spectrum of the seismic waves and we could see that it took less than 15 seconds for the rock mass to be completely mobilized, less than 60 seconds to reach and hit the village, and less than 2 minutes to come to a rest in the river valley. Based on this information and on the field evidence that the mass travelled more than 2.5 km along the slope with more than 1200 meters of height relief, we could also estimate that the landslide crashed the village at the impressive velocity of 250-300 km/h and dissipated an energy of 290 TJ, which is four times more than the 1945 Hiroshima atomic bomb! Using this information, we could estimate through a simple calculation that the landslide debris volume accumulated in the valley was in the order of 13 million cubic meters, a value which matched pretty well with the field observations and the results of very high-resolution mapping which we carried out using a special drone. 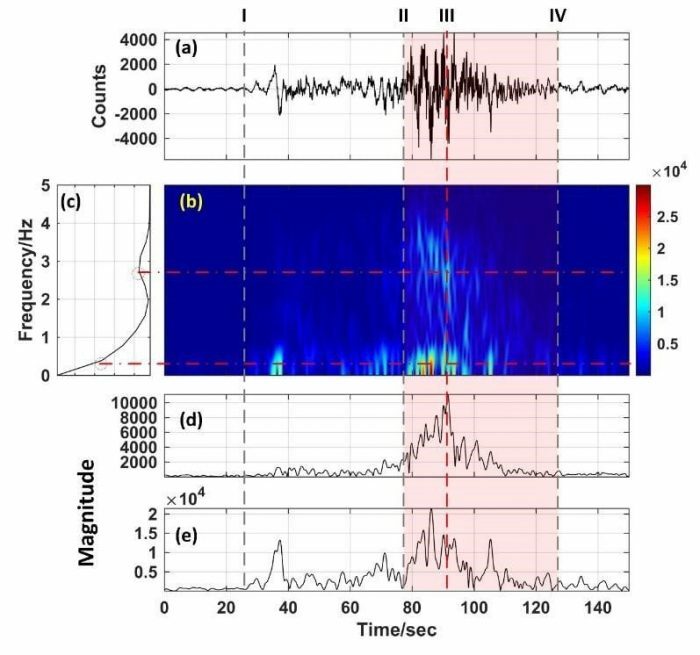 Seismic signal of the Xinmo landslide event recorded at the nearest seismic station (about 40 km apart): vertical component (a); 2D time-frequency distribution spectrum (b); frequency-magnitude spectrum (c); time-magnitude spectrum at f = 2.73 Hz, representative of the high-frequency component (d); time-magnitude spectrum at f = 0.4 Hz, representative of the low-frequency component (e) (Fan et al. on Landslides, 2017). By combining recordings from several stations, we can not only identify a landslide automatically, but we can also differentiate between the initiation of the landslide (low-frequency waves) and its impact (high-frequency waves). We can then locate them on a map, evaluate the landslide travel distance and impact velocity, the type of material involved, calculate how many people and how many buildings are affected and estimate the damage, just like it’s done for earthquakes. If the seismic network is sufficiently sensitive and specifically trained, this all can be done automatically. Within seconds, the competent authorities would receive an alarm on their computer screens and smartphones, containing very detailed information on the event, and would be able to trigger the appropriate emergency response in the blink of an eye, saving as many lives as possible. Currently a Postdoctoral Research Fellow at Charles University, Prague. 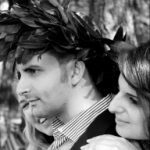 Geotechnical Engineer from Italy, currently Postdoctoral Research Fellow at the State Key Laboratory of Geohazard Prevention and Geoenvironment Protection in Chengdu, China.